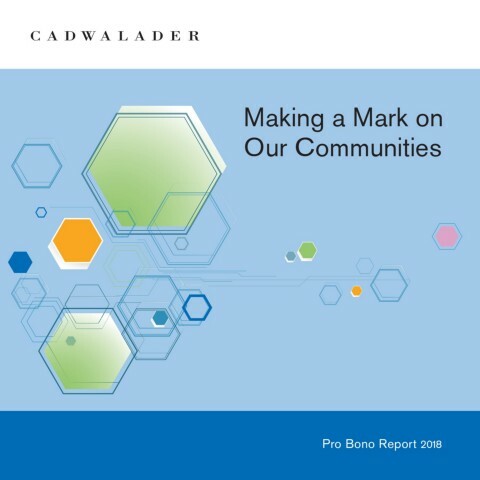 Charitable Support: Each year, Cadwalader is honored to have the resources to provide support to a host of not-for-profit organizations. The firm does not give to organizations that discriminate on the basis of race, color, religion, gender, sexual orientation, gender identity, national origin, age, disability, status as a veteran or status in any group protected by federal, state or local law. Community Service Projects: Cadwalader personnel also participate in efforts that make our communities a little kinder and more promising, such as volunteering at the Caring Community Senior Center, running clothing drives for Dress for Success, donating gifts for the Lighthouse and Salvation Army Gift Exchange programs, volunteering to assemble care packages for the National Day of Service and Remembrance, and blood drives. Fundraising Efforts: Cadwalader personnel participate in numerous community outreach projects from all of our locations. These include fundraising efforts via participation in the American Heart Association Wall Street Run, Making Strides Against Breast Cancer programs, Bike MS, the British Heart Foundation Bike Ride, Climbing to End Domestic Violence, Go Casual for Justice, the Gridiron Games, Step by Step . . . Closer to a Cure, and the Walk to End Alzheimer’s and fundraising for the benefit of the American Red Cross, the Center Against Domestic Violence, the City Bar Justice Center, Crisis, the Food Bank for New York City, Gifts for the Homeless, the Harvey Milk High School, the Legal Aid Society Associates Campaign, Havens Hospices, and many other groups and organizations that seek to improve our communities. Legal Clinics: Given the unique expertise of our lawyers in being able to help those in need of access to justice, it is not surprising that they volunteer at legal clinics, including the D.C. Bar Community Economic Development Project, the Homeless Experience Legal Protections Program, and the New York City Family Court Volunteer Program. Mentoring Programs: Cadwalader attorneys and staff serve as mentors for a host of high school and university initiatives, including the Academy of Hospitality and Tourism, Columbia Law School Partnership, Xavier University and UC Berkeley cross-cultural exchanges, Facing History High School, Fordham Law School in Asia, James Madison High School Moot Court and pipeline programs, and Junior Achievement of New York.